Shaquille Patrick, left and Romell Goodridge in happier times. 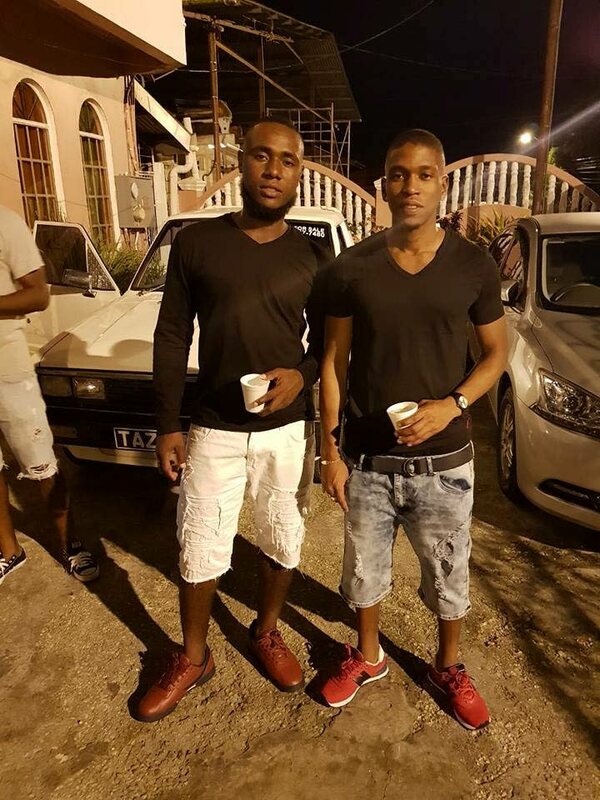 A friendship spanning more than two decades came to a tragic end early yesterday morning when Shaquille Patrick and Romell Goodridge, both 23, were killed when their vehicle crashed into an SUV along the Valencia Stretch, Sangre Grande. According to reports, at around 6.35 am Goodridge, a recently appointed fire officer, picked up Patrick, who was buying breakfast at Valencia junction, in his green Nissan Almera. The friends were heading east along the Valencia stretch when Goodridge swerved onto the westbound lane of the stretch, colliding head-on with a blue Ford Ranger, driven by Israel Khan, of Princes Town. Both Goodridge and Patrick were killed on impact, while Khan escaped with severe injuries. He is warded at the Sangre Grande Hospital where he is in stable, but critical, condition. Officers of the Valencia Police Post and the Sangre Grande and Arima Fire Stations responded to the scene and used the jaws of life to take out the bodies of the men. District medical officer Dr Sarah Cordez pronounced both men dead at the scene. The bodies were sent to the Sangre Grande General Hospital’s mortuary, and an autopsy is expected to be done today. Newsday spoke to Goodridge’s relatives who were overcome with grief after hearing the news of his death. Goodridge’s mother said she heard the news while she was on her way to church. She said his father died in July in 2013, and she was now struggling to cope with the death of her only son. Relatives said Goodridge worked as a clerk in the Fire Service headquarters on Wrightson Road, Port of Spain, and he recently passed his examinations and was looking forward to beginning his career as a fireman. Relatives said Goodridge and Patrick were inseparable and became friends in pre-school. PC Cassiedath of the Valencia Police Post is continuing inquiries into the collision. Reply to "Two dead: Friends killed in Valencia accident"